Britain, with its rich history of monarchies, industry and culture, holds a lesser-known story in its past. It's the story of how people came to be here at all and their struggle for survival in a dramatically changing environment. It begins nearly one million years ago. Britain's unique location - between the Atlantic and continental Europe - means that it has experienced the fullest extremes of climate. Over the past million years, it's climate has fluctuated from balmy Mediterranean-like conditions to long stages of cold with large ice sheets covering much of the land. Landscapes changed accordingly, with coastlines and rivers shaped by water and ice. Britain's inhabitants had to adapt too, although sometimes they vanished altogether. Investigations such as the Ancient Human Occupation of Britain (AHOB) project have provided new insights. This 13-year multidisciplinary collaboration between the Museum and other research institutions has transformed what we know about the earliest Britons and the world they lived in. 'Traces left behind by Britain's earliest inhabitants are scattered across the landscape. 'By combining evidence from animal and plant fossils, tools and other artefacts, we have been able to build quite a detailed picture of the lives of these early Britons and the conditions they faced. 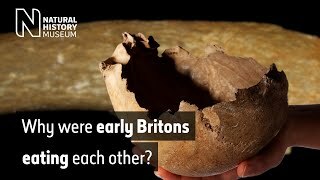 Which human species came to Britain? At least four species of human have attempted to settle in Britain. Who were they? The identity of the very first people to venture here is still a mystery. No human remains have been found, but stone tools discovered at Happisburgh in Norfolk and Pakefield in Suffolk reveal a human presence between 950,000 and 700,000 years ago. Scientists have even discovered a preserved trail of footprints left by a small group of these people as they walked along the mudflats of an estuary. The age of the finds suggests they could have been made by Homo antecessor, a human species so far only found in Spain. Whoever they were, these humans were able to survive in temperatures colder than today. 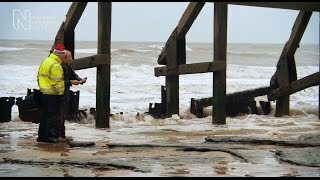 The earliest evidence corresponds to a time when Happisburgh was like modern-day southern Scandinavia. Life was tough for these early pioneers who lived close to the cold, northern pine forests. There were few edible plants, winters were harsh and hyenas were on the prowl - possibly the large, now-extinct Pachycrocuta brevirostris. The floodplain of the early River Thames supported a wide variety of animals, however, including mammoths, elk and horses. The humans at Happisburgh likely scavenged meat from, and perhaps hunted, these animals. In comparison, Pakefield's inhabitants 700,000 years ago would have enjoyed conditions similar to the Mediterranean, and an abundance of plant and animal resources. Tall and imposing, this early human species is the first for whom we have fossil evidence in Britain: a leg bone and two teeth found at Boxgrove in West Sussex. Living here about 500,000 years ago these people skilfully butchered large animals, leaving behind many horse, deer and rhinoceros bones. This suggests they were able to plan and cooperate, hunting as a group. These people were strong and muscular, with large brow-ridges and relatively large brains. They shaped tools with precision. Their handaxes and other stone tools have been found at several sites around Britain. Microscopic analysis shows that tool marks on animal bones lay beneath gnawing marks inflicted by wolves and hyenas. The people at Boxgrove probably had to butcher the animal carcasses while defending them from scavenging predators. Not long after humans were living at Boxgrove, the climate deteriorated. Signs of humans in Britain began to fade and disappear. Of all the glacial periods Britain went through in the last million years, the one around 450,000 years ago - known as the Anglian glaciation - was the most extreme. Human survival in Britain became impossible. The absence of humans lasted for many millennia. We know early Neanderthals were in Britain about 400,000 years ago thanks to the discovery of the skull of a young woman from Swanscombe, Kent. They returned to Britain many times between then and 50,000 years ago, and perhaps even later. During this time the climate regularly switched between warm and cold. Neanderthals learned to adapt and survive by exploiting natural resources, although they were beaten back from Britain several times when the climate was particularly harsh and food scarce. Undoubtedly intelligent, Neanderthals were innovative toolmakers. Injuries found on their prey tell us that they were brave and skilful hunters. Neanderthals probably travelled across the vast prairies of ancient Britain following herds of large animals such as mammoths to seasonal hunting grounds. No human remains or tools have been found from Britain for the period of 180,000 to 60,000 years ago, although we know Neanderthals thrived elsewhere in Europe during this time. At first it was just too cold this far north. Then, when temperatures rose, so did sea levels. Britain was cut off from the mainland before Neanderthals could return. Neanderthals did eventually make it back to Britain, arriving via Doggerland - a landscape now beneath the North Sea. The vast grassland plains supported herds of woolly mammoth, woolly rhino and reindeer as well as predatory wolves and hyenas. The Neanderthals who ventured across the steppe faced bleak conditions, with winter temperatures averaging a bitter -10°C. The lack of trees presented additional challenges, such as a shortage of wood for fuel and to use as shafts for their stone tools. Our own species is a relative newcomer to Britain. The earliest direct evidence is a jaw fragment found in Kent's Cavern, Devon. Scientific analysis estimated it to be at least 40,000 years old. For thousands of years the presence of modern humans in Britain remained brief and sporadic. It has only been continuous since about 12,000 years ago. The modern humans who appeared in Britain were highly adaptable hunter-gatherers. Their ability to innovate was different from all preceding species. They lived in larger groups, had wider social networks and moved over larger distances. This extended interaction led to the sharing of stories and information, including the spread of new ideas and knowledge. Modern humans stand out for their creativity and rich culture. Over a relatively short period, they developed a diverse set of tools, using lighter bone and ivory as well as stone. They created artistic representations of their world through carving, painting and sculpture. Flints discarded far from where they were acquired show that people were routinely moving around the landscape to a much larger degree than the Neanderthals before them. This enabled modern humans to exploit a wider range of resources. This may go some way towards explaining why modern humans survived the tough times that followed, but Neanderthals did not. See maps showing how and when Britain's coastline changed over the past million years, and the impact this had on the presence of humans. Written by experts Rob Dinnis and Chris Stringer, the book Britain: One Million Years of the Human Story takes readers on an incredible journey.